Aside from the Air Jordan Spizike that is set to be released this weekend, Jordan Brand has also unveiled a “Bordeaux” edition of the Jordan Son of Mars, which is already gaining a lot of attention for the past few days. Officially labeled as the Grey / Maize – Charcoal – Sapphire – Red – Black colorway, the Jordan Son of Mars “Bordeaux” features an elephant print and also sports a combined features of some famous Jordan Brand models. There is no definite release date as of now, but this one will be coming out soon so watch out for it! 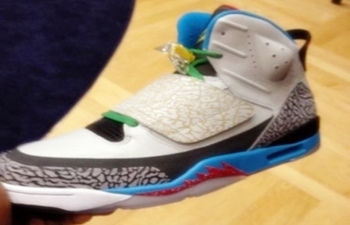 Jordan Son of Mars Coming Out This Month? Jordan Spizike Bordeaux Expected to Make Waves!